It’s official, Denver has a new King of the farmers market scene. This past weekend solidified this finding as I found myself wandering up and down the Pearl Street Farmers Market with the masses. Let’s be clear, there are a number of wonderful markets throughout the Metro. In fact, the Union Station Farmer’s Market is a close second but for a consistently enjoyable experience, Pearl Street is hard to beat. I love that the market is on one main street. It makes it easier for patrons to shop and browse. One of the side streets is used for food trucks and some seating, but other than that, you just have to walk up and down ONE STREET. South Pearl Street has a great look and “feel” to it with historic buildings housing bricks and mortar businesses. Parking is a little tight because it’s in the middle of a residential and business district. Happily, the market is pretty easy to get on foot, by bike, or via light rail. If you ride your bike to the market there is manned bike “parking” with usually 2 attendants watching over the bikes. If you park your bike there you will be handed a ticket, when you’re done with your browsing, show the attendant your ticket and then get your bike. Please remember to tip a dollar or two before you leave. Most vendors have credit/debit card readers but I would recommend that you bring both cash and card just in case there is a problem with the card reader. Are pretty affordable, varied, and passionate about the products that they share. Sometimes buying locally can be a little more expensive, but I was finding that some other local markets were significantly more expensive because of the types of vendors and products being sold. The Sophisticate’s Tea-Listen to my podcast episode with Trinity Hindman (one of the founders). What exactly is it? It is a tea concentrate I particularly love the Sophisticate’s Mountain Fog Concentrate. Sweet Jayne’s Pastries-so freaking delicious. If you love pastries, this is the place to indulge. Tlaquesalsa-I’m convinced that this is the best salsa made in Colorado. I’ve tried all three flavors (Tomatillo, Arbol, and Jalapeno) and I love all three. The $10 all you can fill bag of veggies at the veggie and fruit vendor whose name I can’t remember. This stand is pretty busy and should be easy to find. Therefore, be aware that not all of the veg/fruits are grown in Colorado-but, if you’re looking to be kind to your grocery budget, this stand is for you! Retains an ease and approachability that similar markets seem not to have. There are tons of people walking with their kids, friends, and fur babies. The vendors seem happy to be there and it’s nice to have the option of popping into one of the many stores or restaurants that flank the market. There is a distinct lack of attitude and a very real sense of warmth. I love this market. It’s open on Sundays from 9-1 pm. I am a chocolate addict. When I emotionally eat, good chocolate is what I like to reach for. Also, when I’m happy…you get the idea. I love all things chocolate. So, when I noticed a large number of chocolatiers/chocolate companies in Denver, I thought it would be great to talk to a couple of them to figure out what the deal was…and, hopefully score some free chocolate. I didn’t get any from Matt because I forgot to…ask..beg. But, we had a good time talking about chocolate. Enjoy the interview. What’s the deal with all the chocolate? There is a ton of great chocolate being made in Colorado. I’ve had a great time “sampling” all of them. Dead Dog Chocolate has changed to Cultura Craft Chocolate. Why the branding change? What Matt’s role is in the company. Matt is originally from Cali (with a couple of stops along the way). I’m curious about how he got connected with Culture Craft Chocolate. Chocolate makers vs. chocolatiers. What’s the difference? The ongoing process of educating consumers about their chocolate (quality vs. cost). I love supporting local businesses and know that cost and getting consumers to be comfortable with potentially spending more is an ongoing challenge. Matt’s business experience in Colorado so far. We get sidetracked by his taco love. It’s kind of hilarious how much he loves tacos. He let’s me know if Denver has any good places to check them out. We discuss how Matt got into chocolate making. It’s a pretty cool story! Drinking chocolate and getting consumers to make the switch to higher quality chocolate. It has less sugar but tastes so good. I wonder about his favorite chocolate and the most popular bars that they sell. I love blogging about Colorado and sharing all of the great activities, resources, and cool things happening here. One of the communities I belong to is the Denver Bloggers Club. For those of you who are into blogging join this group. Great people, amazing resources…and free food! The April meeting was held at The Egg and I and I wanted to share my experience. 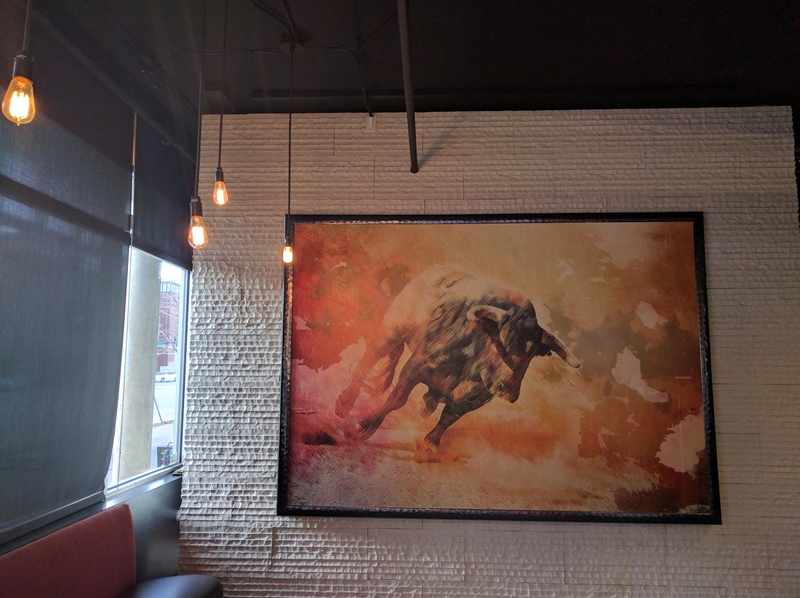 I had the opportunity to eat at The Egg and I as part of a Denver Bloggers Club Meetup. While I knew some things about The Egg and I, I’d never had the opportunity to try it out. There are over 100+ locations across the U.S. These locations are typically found in the Central U.S. not the Coasts. I went insane for the Kale Cooler. Seriously. I had three glasses of it. I actually loved that Kale Cooler (and the Pineapple Tonic) so much that I wanted to suggest that they sell it in stores. That good. By the third glass I just owned my greediness and kept on drinking. Soups and salad dressings are made in-house. 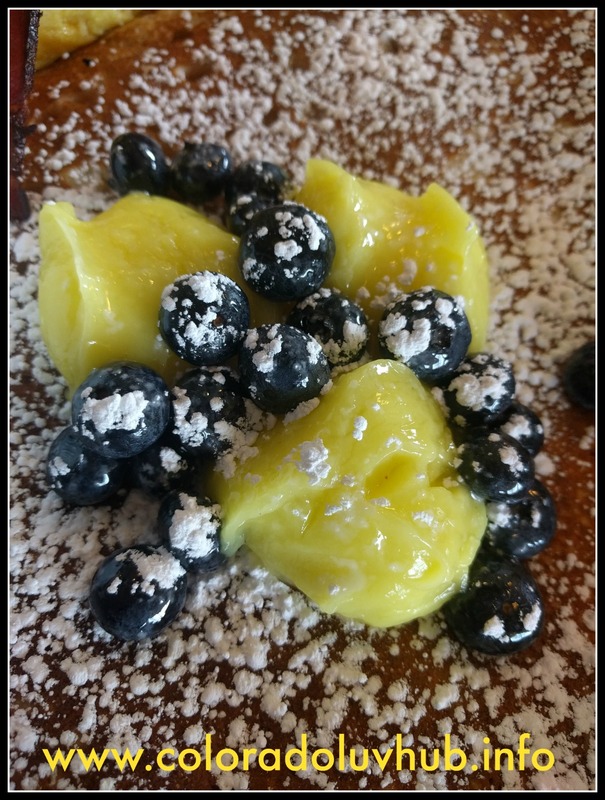 The seasonal specials-I had the Blueberry Lemon Curd pancake combo. Loved it. I’m looking forward to trying out their pumpkin waffles. The plating size-No skimping on the servings. You will be full after you leave. You can hold meetings at different locations (with wifi/etc.) Great use of the space. The staff! They are amazing and you can tell that they really care about customer experience and the company. We got some great swag!! I wasn’t expecting that. They gave us hot sauce (I knew then that they understood me) and a gift card for a future visit. Getting my Kale Cooler soon. If you have those lovely snooty foodie friends that always want to go for fusion food, stuff made with dry ice, and ingredients sourced during a full moon-this isn’t the place for them. If you have friends and family who want a comfortable and family friendly atmosphere, comfort food, don’t care about calories, and just want to enjoy eating a yummy, unpretentious meal The Egg and I is the place to take them. I plan on stopping by the Leetsdale location at 560 S. Holly Street to get some more of that Kale Cooler as soon as humanly possible. Final thoughts: I would also like to extend a huge “Thank You!” to Summer and the rest of the wonderful crew who made my first experience at The Egg and I so wonderful. The Denver Bloggers Club was hosted at the Lakewood location (7830 W. Alameda). If you love supporting local restaurants doing great things The Egg and I should be on your list. One of the weird things about Denver and most of Colorado is that good Mexican food is hard to find. Yes, it’s strange and it has always been like this. But recently I’ve had the good luck to stumble upon a couple of great places to enjoy some amazing Mexican food and Latigo is one of them. Is not what most people think of when they think about Mexican food. I think many people have the experience of variations of street tacos, tamales, or even (if you’re lucky) a good mole. Latigo is a fine dining experience and I am so lucky that I got to enjoy it for free!! Why free? I belong to the Denver Bloggers Meetup and this month’s meetup happened to be at Latigo. I had no idea what to expect and left with my mind blown. This review is entirely my own opinion and the I would like to disclose that I received a free meal and a gift certificate for another meal in the future. Let’s be clear-I’m about to gush and if it hadn’t been such a great experience I would be very clear about that too. I loved how friendly the staff was, the food, and the restaurant space which was open and airy. The location is right across the street from Coors Field at 22nd and Blake and I wonder if a different location with more year around foot traffic would be a better location for Latigo? All I know was that the food was incredible. Let’s do a run-down of the dishes that we had. Was a small plate that comprised of a corn tortilla, shredded beef, lettuce, queso fresco, and a little radish. I especially enjoyed the chipotle sauce that the meat was marinated in. Obsessed. Seafood always feels a bit risky in Colorado because we’re so far from the ocean. Fortunately, I’ve had some amazing seafood at different restaurants around town and Latigo delivered. This was actually my favorite dish. I could have eaten a giant bowl of this every day for the next 7 days. I couldn’t get enough. What I especially enjoyed was how spicy it was and the fact that the shrimp was marinated in lemon vs. the traditional lime. Delicious. Arrived at the table sizzling. Nicely seasoned chicken, veggies, and the fixings. I enjoyed the fajitas but preferred the next dish more because it surprised me. YES! This was one of the more beautiful dishes I’ve seen in a long-time. It was plated gorgeously and even though I don’t eat a lot of pork-I couldn’t get enough this slow roasted pork with achiote sauce and avocado puree. This dish is a traditional dish from the Yucatan. But, I also thought of the Puerto Rican version of pernil-but it’s totally different. I wanted to weep into my drink when I realized that I couldn’t drink it because I was driving. Epic fail on my part. Especially when confronted with a mix of Mezcal, Tuaca, Coffee Patron, chocolate shavings, and whipped cream. I told them that next time I won’t make this mistake and will UBER/LYFT or take the light rail so that I could enjoy this dessert the next time that I visit. The next time you get a craving for Mexican food add Latigo to your rotation. I can’t emphasize enough what a positive experience I had and I’m hoping that you will enjoy it too!